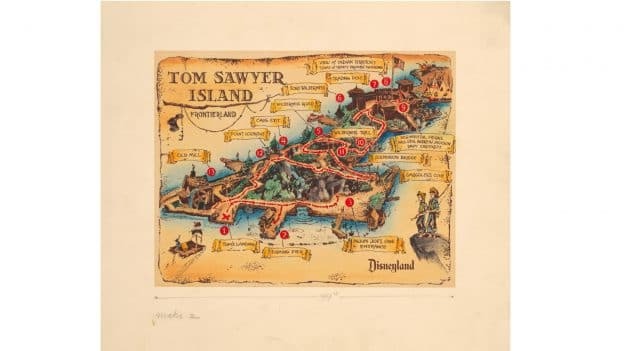 The Disney Parks all over the world still bear many personal marks of Walt Disney himself, and Tom Sawyer Island is perhaps one of the most personal, much of that having to do with Walt’s cherished childhood experiences during his early boyhood in Missouri. Beyond the cartoon medium, live action films such as “So Dear to My Heart” and “Summer Magic” carry a wistful Midwestern nostalgia, and Main Street, U.S.A. is an homage to that certain place and time in Walt’s identity and memory. 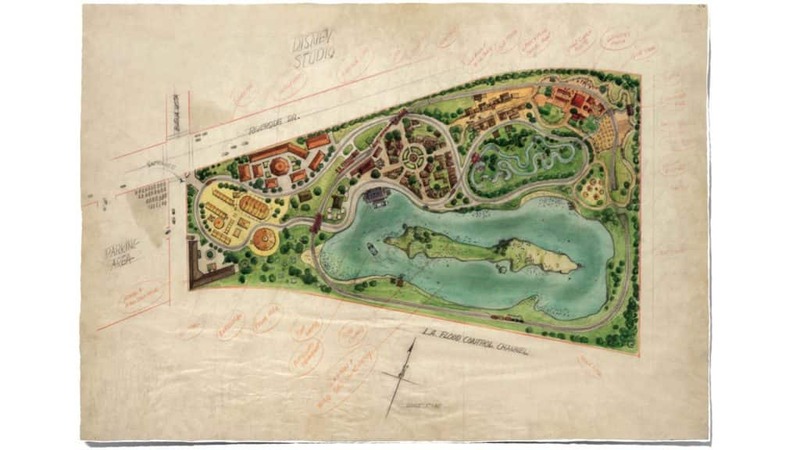 From Disneyland’s earliest concepts, dating back to the late-1940s plans for a park across the street from the Studio in Burbank, an island in the center of a mighty river was always present. The names and activities to be contained there shifted and evolved—from a “Mickey Mouse Island,” home base for the Mickey Mouse Club and the Mouseketeers, to a Storybook Land-like showcase for miniatures of historic American landmarks such as Independence Hall, Mount Vernon, and Monticello, to be viewed from the deck of the passing Mark Twain. Walt decided that among the somewhat “passive” audience experiences within his Disneyland park, a place for self-guided exploration and spontaneous play might be just the thing for the island—and his Missouri-bred love for Mark Twain, and his heroes Tom Sawyer and Huckleberry Finn, provided a foundational story and theme. 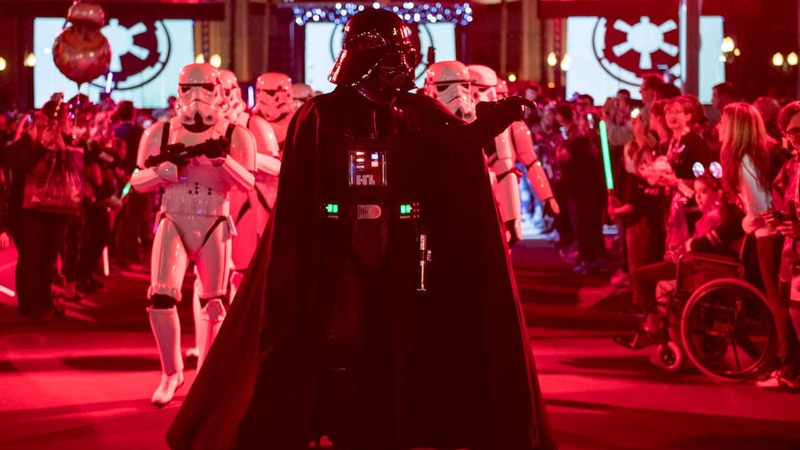 “I put in all the things I wanted to do as a kid—and couldn’t,” Walt said. Like Tom Sawyer arriving to school, his namesake island was late, opening nearly a year after the debut of Disneyland, on June 16, 1956. 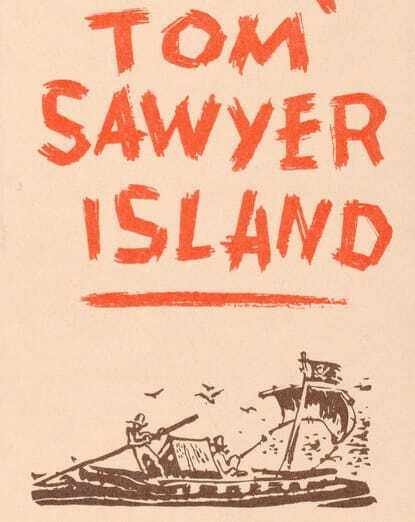 Naturally, when Magic Kingdom Park at Walt Disney World was designed, the popular Tom Sawyer Island was a part of the plan—and like the literary hero and its Disneyland precursor, was tardy to arrive, opening on May 20, 1973. The experience of Tom Sawyer Island was, and remains, something like improvisational theatre. A richly-detailed setting and evidence of the elemental characters is provided, and the individual Guest can simply run free—imagining their own stories and scenarios relating to the characters and situations, or ignoring them entirely. Part of the island’s charm is that it can only be accessed by raft, an homage to Huckleberry Finn’s famous water craft. After disembarking at Tom’s Landing, visitors can explore trails through the wilderness, cross a swaying suspension bridge or bouncing pontoon bridge, and explore the various rock formations and mysterious underground passageways. There are plenty of restful spots to soak up some sunshine, or rest in the shade, and enjoy peaceful waterside oases that hearken to a simpler place and time. Fans of Twain will find ample reminders of the great author’s creations, and the uninitiated will discover the rich heritage of the place. When Tokyo Disneyland in Japan was created, Tom Sawyer Island was included. Although Disneyland Paris put Big Thunder Mountain on the central island in the Rivers of the Far West, the concept was transposed to Adventureland for Adventure Isle. Hong Kong Disneyland has a similar transposition with an island in the middle of the Rivers of Adventure. The island at the center of the mighty river in Treasure Cove at Shanghai Disneyland is currently and enticingly deserted. For more fascinating Disney history like this, check out the “Maps of Disney Parks” book. It would be great to get a copy of Tom Sawyer Island Explorer Map especially during the anniversary. 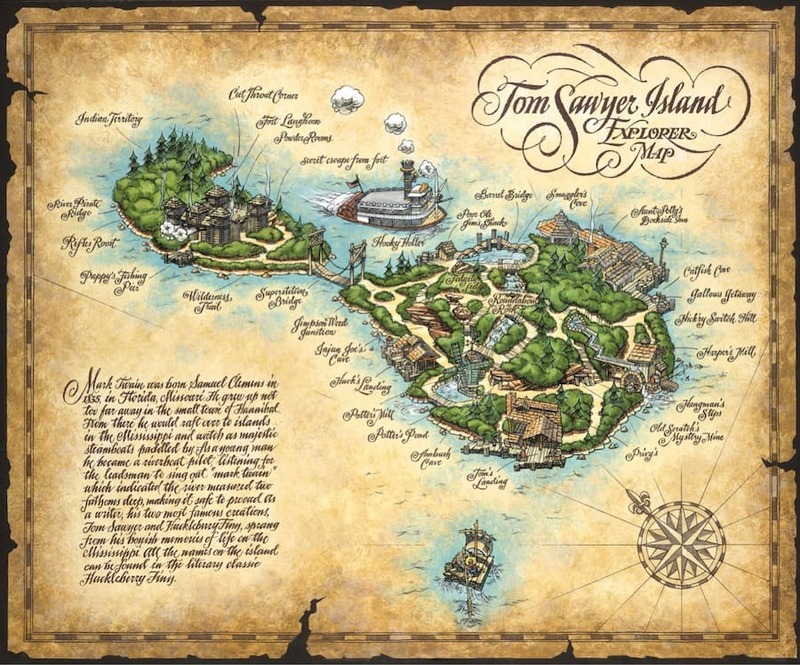 It would be great to get a copy of the Tom Sawyer Island Explorer Map especially when celebrating the anniversary! What followed was a full couple of hours of just plain fun. We are going back this year for our 5th visit, and the 10th anniversary of that first time. Still, that morning on Tom Sawyer’s Island is my favorite Disney memory!!! Love learning about Walt’s personal touches in parks worldwide. Another great piece! The link doesn’t work to get to the book. When you search for the book on the Shop Disney site, it shows up in a search, but then isn’t there when you click the book. Just FYI…. Tom Sawyer Island is always a part of my Disneyland trip whether it is exploring the island or viewing it from the deck of the Mark Twain. In this age of high tech it is refreshing to see children and adults enjoying nature and the simple things in life!